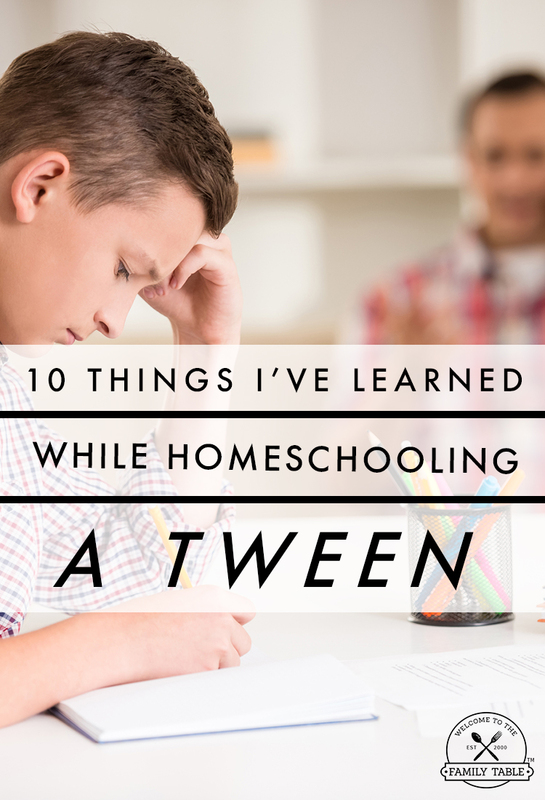 Are you homeschooling a tween? This week we are talking about what we have learned while homeschooling three tweens during our 13 year homeschooling career. And my take will be from homeschooling our tween daughter. While we also have two sons, I have learned a lot more about myself these past few years she has been a tween (she is a fresh new 12-year-old) than I have in my entire 37 years on this earth! I have more patience than I thought. Yep, it’s true. Not saying that patience is quite having her “perfect” work in me, but I surprised myself during this season with our daughter. I am joyous at seeing some of the fruit of my labor in the tween years with all three of our children! Trust is vital. If you don’t trust your tween, it will cause a divide in your relationship that you may just never gain back. Showing your tween you trust them is the key to a pleasant experience with your child when they transition to their teens. See my article The Importance of Trusting Your Tween over at The Better Mom for more light on this subject. Love is key. God is very clear in His word that without love – we have nothing. It is so important that we make sure (at all costs) to walk in love with our tween, ministering to their delicate hearts during this delicate time of youth. In my article, 5 Ways to Minister to Your Tweens Heart, I give some suggestions on ways to keep your tweens heart where it belongs – with Jesus and their family. Sleep is necessary. Not just for me, but for them. I was beginning to think our daughter was lazy as she was sleeping in longer than usual, but through prayer and observation I realized my baby girl was busy growing and changing in ways that were not so obvious at first. I don’t need coffee, it needs me. I started drinking coffee shortly after we moved to Germany. I am certain it was the long dark winter and husband leaving just 6 short weeks after our arrival that made it appealing. Not to mention a little someone (I won’t name any names — SOLOMON) that wakes up at 4:45am like clockwork. This night owl was having a hard time with it all and started to befriend coffee as I thought I needed it. Well my daughter showed me how much coffee was not needed as she challenged me to not drink coffee for a couple of days as she was concerned for me about the caffeine intake (learned something in science that alarmed her). So I took her challenge and thought I was going to die. Really. I had headaches and was vomiting. It was ridiculous. I knew at that moment that coffee needed me, but I certainly did not need it. No. More. Coffee. Ever. And all this courtesy of my tween beauty. Deployments are hard. Not that I didn’t already know this. But this past year long deployment we went through as a family was a rough one. Especially for my tween and I. She missed her daddy so bad it hurt – and she tended to take it out on me. Every. Single. Day. But the good news? We got through it and I learned that I am actually a loving and nurturing mother. She told me herself and I am grateful. Identity is crucial. Being rooted and grounded in who you are as a parent is crucial for not only yourself – but for your tween. I have learned more about myself homeschooling our tween than ever before in my motherhood journey. I learned that my identity is crucial for her security and for reinforcing the boundaries set in her life. I realized that even when times are rough, that she draws strength from me and who I am in Christ. It is a beautiful anomaly. Everything changes. This is common sense, but something that has taught me great things about our daughter as well as myself. Although things are constantly changing around us – it doesn’t mean that we have to change our love for one another. Thankfully I have learned to love her even when her mood changes, or when her attitude changes, and yes, even when she is going through hormonal changes (or me Haha). Loving when it’s hard. Playing off of #8, I have learned how to better love someone when it’s hard. Raising children is not for the faint at heart – and raising *my* tween is no easy feat. But I love her none-the-less. Don’t get me wrong, she is an amazingly sweet, hilariously funny, and smart young lady with a zeal and fervor for life. But when we go through difficult times, they are difficult. But no matter what, I love her. She is my baby girl and we work through our mess to find the beauty. Every. Single. Time. I don’t like shopping. Hahahaha. I used to adore shopping – or so I thought. However, while raising my tween, I have realized that I do not like shopping. I think her love for shopping has shown me just how much I dislike it. She loves to shop (in person or online) for books, clothing, music, clothing, clothing, oh and did I mention clothing? Oh, well you get the picture. But because I love her, I just grin and bear it. After all, a little window shopping never hurt anybody!